Where to find Bariloche hotels near an airport? 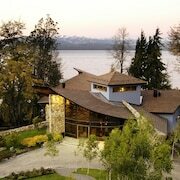 How can I find hotels in different Bariloche neighborhoods? Where can I find hotels in Bariloche that are near tourist attractions? 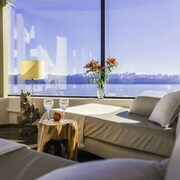 Bariloche has a quality assortment of comfortable hotel and apartment options to choose from. You can search no less than 81 accommodation options within 0.1 kilometres (0.06 miles) of Bariloche's downtown in Expedia's handy booking pages. Enjoy staying close to downtown Bariloche. Hotels in the vicinity include Charming - Luxury Lodge & Private Spa and Lirolay Suites. Llao Llao is a neighborhood that offers 2 places to stay which makes it the area with the largest selection of Bariloche places to stay. 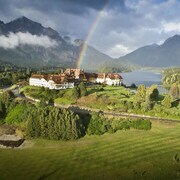 The Llao Llao Hotel & Resort Golf-Spa and Tunquelén are just some of the hotel establishments in Llao Llao. Alternatively, you could find accommodation in Villa La Angostura, which is the neighborhood where you'll find the Luma Casa de Montana and Correntoso Lake & River Hotel, or Puerto Manzano, home to the Aldea Bonita and Alamos de Meli Tue Cabañas. 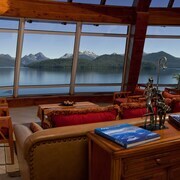 The Estancia Peuma Hue Carre Lauken and Casa del Lago are located in Lago Gutierrez, while Aldebaran Hotel & Spa and Bahía Montaña are part of the Lago Nahuel Huapi area. Students, families and those keeping an eye on their dollars will find some great Bariloche hotel and apartment options that definitely won't blow holes in their wallets. The Colina del Manzano is 40 kilometres (25 miles) from the center of Bariloche, while the Los Juncos-Patagonian Lake House is 12 kilometres (7 miles) away. Two more options in the cheaper range include the Cabañas Villa Pañil and the Villa Sofia Resort & Spa. The Village Condo is situated 5 kilometres (3 miles) away from downtown Bariloche. Another hotel is the Club Hotel Catedral Spa & Resort, which can be found 4 kilometres (3 miles) away. Two more accommodation options worth looking into are the Galileo Boutique Hotel and the Ski Sur Apartments. 40 kilometres (26 miles) away from Bariloche you will find Villa La Angostura, where you can spend the day visiting Los Arrayanes National Park and Villa La Angostura Ski Resort. 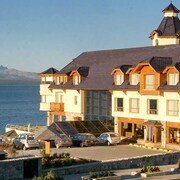 The Bahía Manzano Resort and Las Ramblas de Puerto Manzano are a few of the Expedia-listed hotel options in Villa La Angostura. Or, you could consider staying in Downtown Bariloche, 9 kilometres (5 miles) to the east of Bariloche, where you can pick from the Alma del Lago Suites & Spa and Panamericano Bariloche. The Municipal Capilla La Inmaculada Historical Monument and Centro Cívico are a couple of the popular places to check out when you're in Downtown Bariloche. 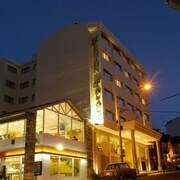 Thank you for checking out our Bariloche accommodation page. Next, do yourself a favour and spend a few minutes exploring Expedia's Bariloche travel guide for the inside scoop on this area's things to see and do. What are the most popular Bariloche hotels? Are there hotels in other cities near Bariloche? 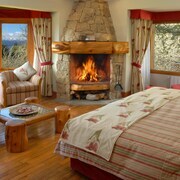 What other types of accommodations are available in Bariloche? Explore Bariloche with Expedia.ca’s Travel Guides to find the best flights, cars, holiday packages and more!